Our last blog post was about experiential learning – or learning through experience. How might that work for Placing Literature? Here’s our vision. Take the Kolb Experiential Learning Cycle (see last week’s post) and superimpose our process on it. Our hope is for a lot of things with Placing Literature. We want to create conversations around literature and places. We want to create connections between people and neighborhoods. But, mostly we want people to love all of the great, living places that we call home and (hopefully) reawaken the emotional connection to those places. This entry was posted in Uncategorized and tagged experiential learning, neighborhoods, placemaking, Placing Literature on October 31, 2013 by katiecwilliams. 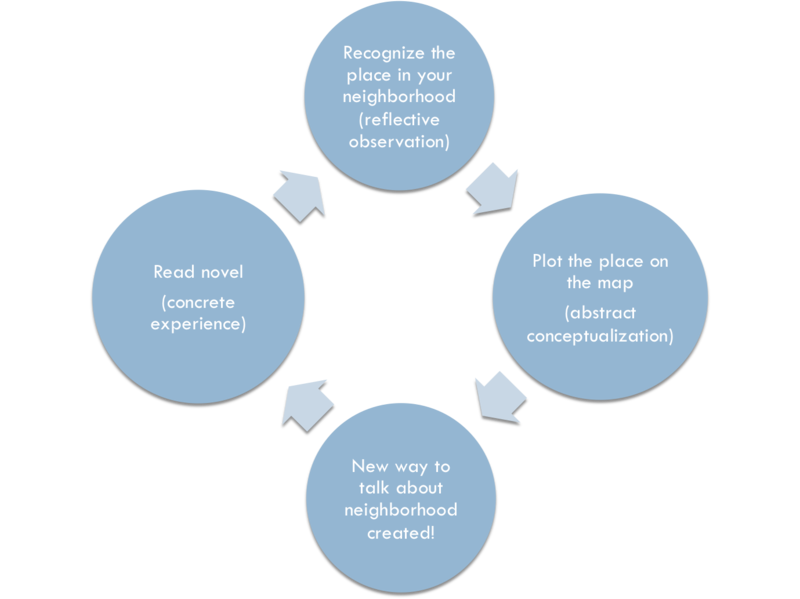 One of the goals of Placing Literature has always been to bring people closer to their neighborhoods and the places they know. One of the theories behind the website is experiential learning. What is experiential learning? It’s a teaching approach that relies on learning in context, or learning where you are. You know how you watch a video to learn something. They you think about, figure out how you would do it, then you try to do it? When you watch the video, that’s the experience of a concept. Next, you think about it. What did the person do? How did they do it? How did that influence the results? That’s you reorganizing the experience in your brain. Then you think about how YOU would do it. Then you experiment and you get it and it’s yours! Of course…it’s a cycle, so then you think about what you did, why it did or did not turn out like the video and then you know what to change for next time. In short, it’s learning by doing. As you can see it’s more complex than that. It’s a cycle where you see, try, think about it, learn, transform. It is really exciting to see that experiential learning is a theory that is becoming a part of the curriculum at all levels of education. For example, place-based education, based on experiential learning, seeks to connect people (of all ages) to the places where they live. Next week: How experiential learning and Placing Literature are connected. This entry was posted in Uncategorized and tagged experiential learning, experimentation, place-based education, Placing Literature on October 25, 2013 by katiecwilliams. I had the pleasure of attending an excellent lecture last week on New Haven poet and short story author Joseph Payne Brennan. Focusing on horror, mysteries and the combination of the two, Brennan was a regular contributor to Weird Tales in the 1950s until publishing his own literary magazine called Macabre. His most well-known short story, “Slime”, was the inspiration for the classic B-horror flick The Blob. Later in life, Brennan ended up working at Sterling Library at Yale, where the largest collection of the author’s works is still housed. The lecturer, local arts reporter Christopher Arnott, is a huge Brennan fan and is on a crusade to re-introduce the late author to new audiences. What struck me is Brennan’s use of place in his writings. A lot of horror authors set their stories in real locations because the “realness” adds a bit of titillation for the reader through recognizable details. I’ve mentioned before that a story about a vampire is much more exciting if the vampire hunts in an area that is recognizable to the reader or close to the reader’s heart. What’s fascinating about Brennan is that the villain in his stories is often the misguided urban renewal policies that were rampant in cities throughout the country in the Fifties and Sixties and especially in his hometown of New Haven. Many of his stories lament the loss of charming neighborhoods and historic homes that are being razed for redevelopment, gentrification and highway construction. Often, a character or apparition crumbles to dust as a cherished building is demolished. Scary stuff, indeed! Brennan’s poems and stories rely on the spiritual connection that people have to places—whether it’s a colonial home on historic State Street where multiple generations of the same families have grown up or public spaces like the New Haven Green that have seen communities spawned and evolved around them. And he uses real places in an effort to make a political statement about the loss of these places around him—he’s talking directly to the politicians that are making these policies. The connection between literature and place goes both ways in Brennan’s writings. The stories give us a greater appreciation for places he writes about, and the places give his stories a realistic component that helps send chills up the reader’s spine. A master craftsman, Brennan knew that this connection is vital to both communities. Check out a place that Arnott mapped for Brennan’s short story, The House at 1248. This entry was posted in Uncategorized and tagged Joseph Payne Brennan, literature, New Haven, place on October 17, 2013 by katiecwilliams.